A new documentary about my work to spread respect for science is in theaters now. You can watch the trailer here. What questions do you have for me, Redditors? Once again, thank you everyone. Your questions are insightful, inspiring, and fun. Let's change the world! I meet people who believe in the Ancient Aliens shows. They believe that an Advanced sentient species invented space craft, came to Earth and taught primitive humans how to make what are basically large piles of rocks we call pyramids. How can I simply and easily disprove the Ancient Aliens or similar theories? Debunking such things take time. I encourage your believer friends to appreciate how much humans can accomplish. For me, these shows encourage people to presume that our ancestors weren't very good at figuring things out. It breaks my heart. Be skeptical you all. How long did you drive around that car you grew grass all over? Always my favorite. A few days. We used that same car to make a point in the Pollution Solutions show. Not to shock you, but that Cadillac was on its last legs (or wheels), when we shot the windy grass. It was a memorable scene. Very proud to have been on cameral for it. 1) Could you give us more details on Light Sail 2, Light Sail 2's journey and destination? 2) After Light Sail 2, What is next, will there be a Light Sail 3 and more? 3) Other than solar sail technology, is Planetary Society looking into other types of space propulsions? 4) Will Planetary Society expand to other countries? Hi Bill. If the Sun is hot, why is space cold? There is a fantastic amount of space in space. I mean it's not all that cold, is it? It's 3 Kelvins. Toasty. If you never became “The Science Guy” what do you think that you would be doing right now? I'd be working on either airplane hydraulics or antennas (antennae). These are where the mechanical shapes, the electric fields, and the math intersect. Big fun! Hey Bill, in the education field & am curious what you feel is the best way to constructively take advantage of how often kids have a screen in front of them now? The screen is the source of nearly limitless information. All things in moderation. I'm a fan of "flipping the classroom." Watch a fraction of the less on your own time. Get individual instruction in class. It is absolutely not a panacea, but screens are certainly part of everyone's future, both formal and informal education. What celestial body captivates you the most and why? Our Sun. It's my favorite star. It's responsible for our cozy environment and vast majority of all living things, like you and me. It's also a key to our electricity providing future. Beam On! Are you OK with me using Bill Wi, the Science Fi for my router SSID? You wouldn't be the first. Go wild. 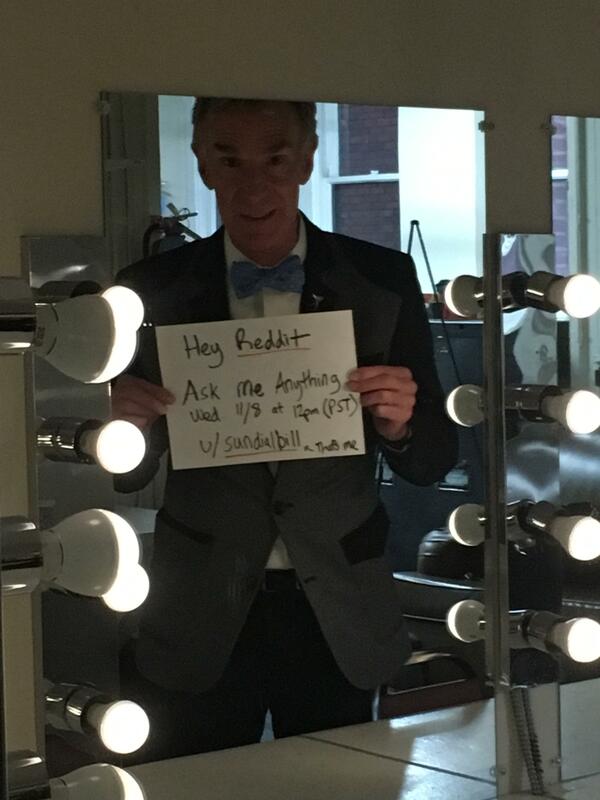 Hello Mr. Nye! You have shown great enthusiasm for Mark Z. Jacobson’s work, claiming we can switch to 100% wind, water and solar power if we just “decided to do it.” A few months ago, a group of scientists (Clack et al.) refuted this claim in a PNAS article, because Jacobson said we could increase hydro by a factor of ten to make his model work, even though there is not nearly enough precipitation available. Now, just recently, Jacobson is suing the National Academy of Sciences for defamation and “fraudulent claims.” It seems like science should not be decided in court. Do you still support this man? Even though climate scientists James Hansen, Kerry Emanuel, Tom Wigley, and Ken Caldeira state the need for nuclear is non-negotiable because the numbers don’t add up without it? It is evidently true that the only highly-decarbonized grids like France, Norway, Sweden, Finland, Ontario and Costa Rica are hugely based on hydro and/or nuclear power. Nuclear has evidence to be the best tool in our climate toolkit, but yet you appear to be dismissing it, because the politics surrounding it are unpopular, similar to your previous stance on GM crops. Your thoughts? This is a great question. From what I've read, the reason Dr. Jacobson is suing the National Academy has to do with some details regarding publishing debunking claims in unilateral fashion, to wit, without giving him a chance to defend his figuring. From what I can infer from your question, you've decided the case. Well, we'll see. Regarding nuclear power, the biggest problem the industry has is that no one wants a nuclear plant around-- in their neighborhood. As a result, it takes 15 or 20 years to get a plant licensed. The Solutions Project people point out that it's a long time, time that we probably don't have. The nuclear power plants in France, by way of example are going on 40-years old. Will they continue to operate reliably? Or, will they start to show signs of wearing out? Will their licenses be renewed? We'll see. Keep in mind also, France's economy is smaller than California's. I believe the Solutions Project is imagining changes on a larger scale. With all this said, that people like you are talking about the idea of a completely renewable energy system and questioning assumptions is of great value. What science based conspiracy theory do you think is most harmful to the public's understanding of dangers facing the world? The trouble inherent in conspiracy theories, as the term is used nowadays, is the presumption that there is a "deep state," that there is a group of five dozen people, who are running the whole show. The world is far, far more complicated than that. If you want to change things, don't look for a conspiracy, be a leader of your own instead. What tv shows do you currently watch? What's your favorite? How do you respond to people being dismissive to you because of your past as a children’s show host? Someone can dismiss me based on his or her perception of my credentials, but the climate is still changing at an extraordinary rate, and humans are the cause. That's not rocket surgery. It's science, true whether you believe it or not. Are there standard & well-tested ways of training young children to think critically? How can we encourage this for those children where parents & teachers seem to be strongly discouraging them from learning these mental skills? Hi Bill, how do you feel about the Universe of Energy ride being closed at Epcot to be made into another ride? I always liked the ride and sad to see it go. Hi from Italy: do you have any opinion about new controversial theories on the functioning of human mind on quantum level? I'm speaking about bioquantology ideas by dr. Al Khalili or the quantum mind theorized by Hameroff - Penrose. Thank you for your time. I don't have much of an opinion formed on quantum functions and human minds. Brains? Maybe. We're made of atoms, which obey quantum mechanical laws. Until now, I'd never seen "bioquantology" as a word. I'm open-minded of course, but very skeptical. It sounds like physics. Is it really? Stay tuned. How important is dark matter? If we figure that stuff out, what does that do for existing theories? I often reflect on my grandfather, who knew nothing of Relativity growing up. Now, we all rely on relativity to use our car or phone navigation systems. Who knows where the deeper understanding of Dark Matter will lead? Are there "darkens," particles of "dark?" Stay tuned! Boxers all the way for me. To each, his or her own. My brother wants to know: Why don't electrons collapse toward the positively charged protons in the nucleus of an atom? Magic.... No wait. It's the nature of atomic forces. Start by noticing that it must somehow be more complicated than electrons in orbit. If it were that way, they'd spiral into the nucleus and be annihilated. The move in "orbitals" rather than orbits. If things were any other way, things would be different. Great to see you here! Bill Nye the Science Guy was one of my favorite shows growing up. Science does indeed rule. My question - What was your favorite TV appearance outside of your own shows? I thought you were hilarious in Stargate Atlantis. Uh.... I don't have one favorite. Stargate was cool. So was Amy Schumer. I just shot a scene with the Muppets for an upcoming Sesame Street. I got the crew to laugh (not easy). I love playing Professor Rubicon on Miles From Tomorrow Land. Turn them all up loud! I'm pretty sure I don't currently have a "mentor," as I understand that expression. I have a great many academic, scientific, entertainment, and engineering colleagues whose council and advice I seek routinely. It's just that I'm the grownup now, with the experience, leastways, I'm supposed to be. I have colleagues more than a mentor. Carry on. Do you think that in the near future/now climate change might become the spearhead for an armed conflict? Would that war even be worth fighting for? Hi Bill, what are your biggest plans for 2018? If nothin' don't happen (sic), we'll make some more Bill Nye Saves The World shows. I also want to polish a screen play and make my feature film. Then, I think I'd like to go for a long bike ride. In terms of influential politicians, which ones do you think you've had an impact in changing their minds? Scientifically speaking, in your opinion is a hot dog a sandwich? I like sandwiches. I like hot dogs. In current English usage, I strongly recommend specifying which you'd like. The words and phrase are not interchangeable. It's a complicated world, I guess. I've always loved your work, science guy! Clearly, science advocacy is an important subject, and we should have more advocates as well spoken and enthusiastic as you are. On an unrelated note, tell us more about your bow tie. When did you start wearing one and why? Do you have a bow tie sponsorship? I feel like that's a solid gold opportunity. First of all, check out some of my ties on NickGraham.com. He was the inventor of the Joe Boxer brand. He got tired of being retired, and we're in business together. I started wearing bowties in high school, when I was a waiter at the "Girls' Athletic Banquet." I wanted to impress a certain classmate. It was a marginally effective tactic. I since discovered that bow ties do not slip into your soup or flop into you flask. They're better in every way, compared with or to a straight tie. If it was an option, would you be willing to debate climate change with a denier the way you did with Ken Hamm and evolution? (which by the way you handled wonderfully). I can't help but think you'd change a few minds.